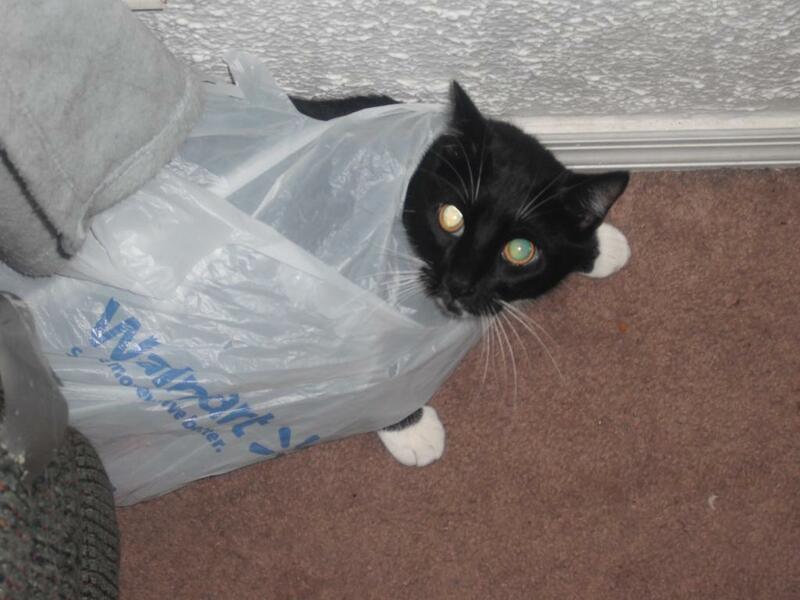 Cats and plastic bags…. they just don’t mix. Maybe that should be on the warning label printed on every piece of plastic in existence along with THIS BAG IS NOT A TOY. Both of my current cats have had their own run ins with a stray plastic bag in my house that I managed to capture on film… but Ody wins the contest for the best look that would have fit right in with an early 80’s music video. The glowing eyes help accentuate his extremely unhappy mood at his baggy situation. Just let me take a few more pictures of your misfortune Ody, and then I’ll free you from your plastic straitjacket…. I promise. This entry was posted in My Top 200 Photos and tagged bag, cat, glowing eyes, ody, photo, photography, plastic. Bookmark the permalink. He’s thinking “just typical of the modern age, taking pictures instead of helping out, when I were a kitten” etc etc. That’s odd… I wonder why Mecca’s using Walmart bags…. Back “in the day,” our cats were totally hooked on PAPER bags. Not only were they great places to high, but they made a delicious crackling noise, too. And oh the joy of cardboard boxes! I see “get me the **** out of this bag Human – NOW!” in those electric eyes. Can only imagine the crankiness a stuck plastic bag might induce. Hang in there Ody. If Ody is like our cats, you laughing at him while taking photos isn’t helping his mood. He really got himself in a predicament there! And you took a picture before helping him and I sit here laughing. It’s no wonder that cats can be a tad vindictive at times!